As you all know my family is all about ooey gooey sticky fun and this DIY marshmallow finger paint was a big hit at our house this weekend! All you need are 3 ingredients and your children will be in ooey gooey sticky heaven! Did I happen to mention that the finger paint is edible!! Now we are talking fun!! Make sure you dress your kids appropriately as the food coloring gel may stain. We didn’t have any problems but you just never know. 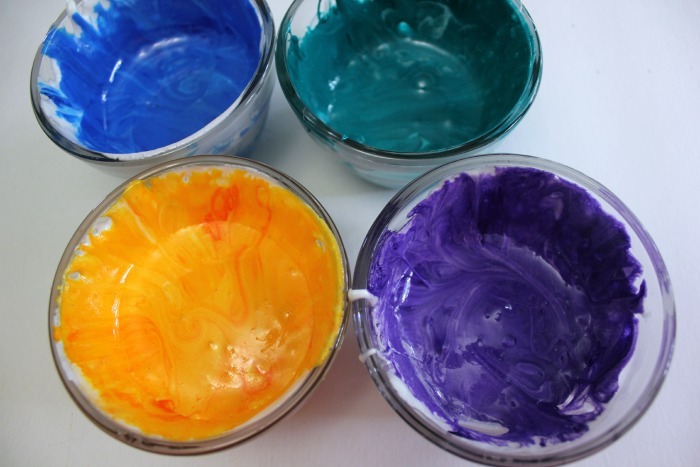 Ok, let’s get ready to have some ooey gooey sticky marshmallow finger paint fun!! You will need a few bowls for this project. 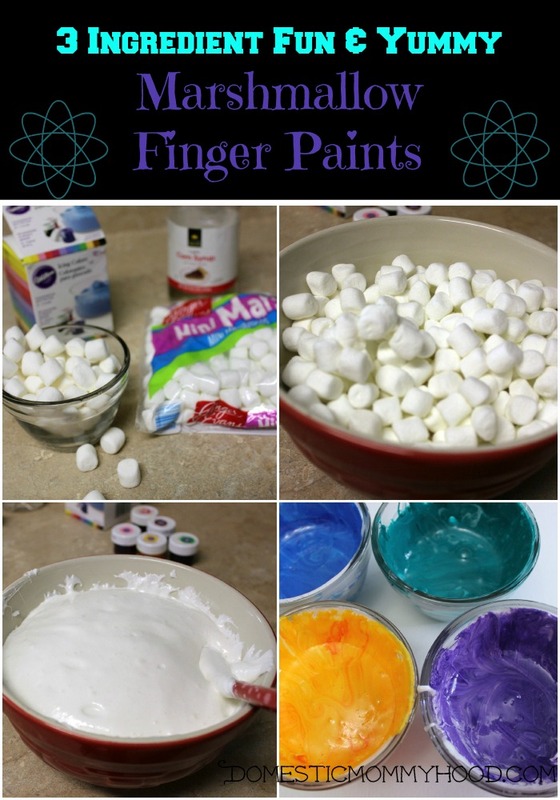 One large one to heat up the marshmallows and a few more, one for each color of finger paint that you are wanting to make. 1) Begin by placing your small glass bowls on the counter and adding a few drops of corn syrup to each one. Then place a small amount of food gel into each one. You do not need to mix them together at this time. 2) Have your spoons ready by the bowls because you will need to move quick once you get the marshmallows melted and be ready to stir. This is where it begins to get sticky but it will be well worth it! 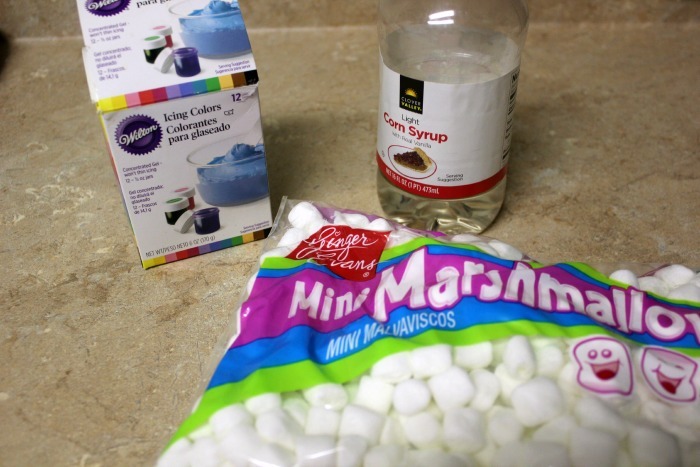 3) Place your 4 cups of marshmallows into your large microwave safe bowl and place into the microwave. It is important to be very careful when heating this up because the marshmallows will puff up quite a bit and if you heat it to long……it will overflow. I know this because my oldest Alicia did it! LOL I heated it 3 different times mixing it between each time. Here is the amount of time that worked will for us. then for another 25 seconds and stir again. All microwaves are different so keep a close eye on it. You are looking for a smooth creamy consistency. 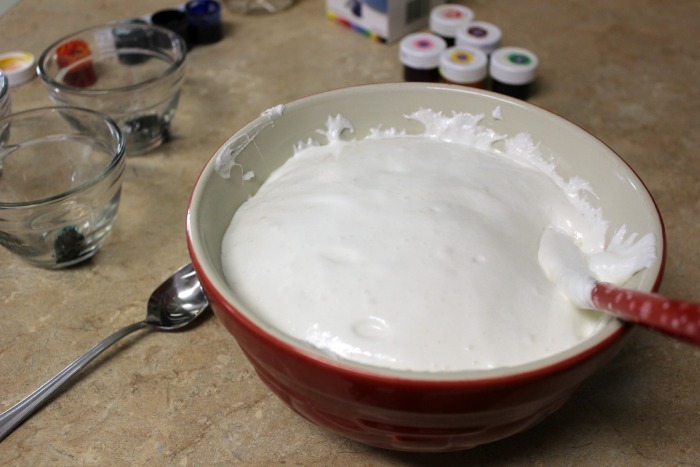 4) Once you have gotten the correct consistency you will want to quickly poor it into the smaller bowls and mix together will the food gel and corn syrup. It is not uncommon to have to heat it back up a bit by the time you get to your last bowl. This stuff hardens quickly. Once you have all of it mixed together it’s time to paint!! I will say that at this point I did place on the bowls back in the microwave just to give it a quick warm up. It helps it to keep the smooth finger paint constancy. Now it’s time to finger paint!! Your child wants to taste the marshmallow finger paint right??? Well by all means let them give it a try!! 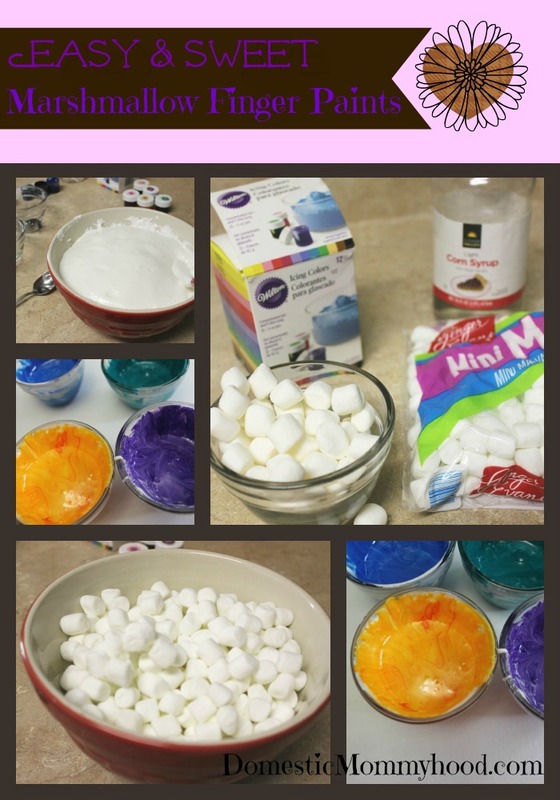 Looking for more fun and messy kids activities?? Make sure and stop by and see our fun ways to paint without a paintbrush section! This looks like it would be fun to do with the kids. Oh man! My kids would really love this. This looks so cool! What a great idea! Thanks for sharing this with my family too! I have a question about this, so how long does it take to dry and is it sticky? also how sweet is it? I’m not sure how long it would take to dry. We always just hung our art for a few days or a week and then disposed of it. It is extremely sweet! !